Today marks the start of the 100 day countdown until Gary Ross' The Hunger Games arrives in theaters next March, Lionsgate's movie based on the popular book series. 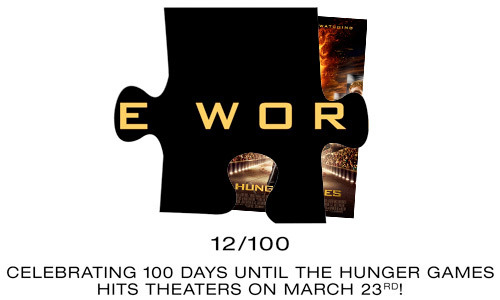 To celebrate the day, they've launched a massive poster puzzle hunt online, where 100 various puzzle pieces are scattered around the web and must be found to create/unveil the new official poster. We've got one clue (#12 of 100!) and there are many more to be found, mainly by searching for the #HungerGames100 hash tag on Twitter or following Facebook. I'm excited to see what the poster will look like revealed, so let's start finding puzzle pieces out there now! Update! The event has ended and the official poster has been revealed! You can view it in full high res on our website by clicking here. It has Katniss standing in the arena, with faces of her & Peeta. Check it out! We'll continue updating throughout the day and will post the official poster in full once it's revealed. The idea of this is to find all the puzzle pieces and print them out to get a big look at the full poster, then take a photo and upload it to be the first one. If you're a whiz at Photoshop, it might also be just as easy to connect this puzzle in there (with 100 layers). 100 different websites have been given 100 different puzzle pieces, so we've got a lot of places to look. I hope this doesn't take too long to find all the pieces! Follow on Facebook. The Hunger Games is both written and directed by Oscar nominated filmmaker Gary Ross, director of Seabiscuit and Pleasantville previously, but also writer of Big, Mr. Baseball, Dave, Lassie, Pleasantville and Seabiscuit. It's adapted from Suzanne Collins' popular series of novels, first published in 2008. Lionsgate is bringing Hunger Games to theaters everywhere March 23rd, 2012. May the odds be ever in your favor.